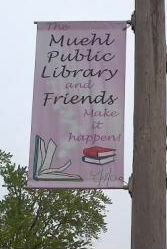 The Friends of Muehl Public Library is an ever growing non-profit organization that believes libraries are a vital resource in every community. We are a 501 (c) (3) organization and we are classified as a public charity. An exciting program that FMPL has taken on! FMPL cares about fostering readers and the habit of reading within young families. Stickers giving credit to FMPL will be put in each book given away. 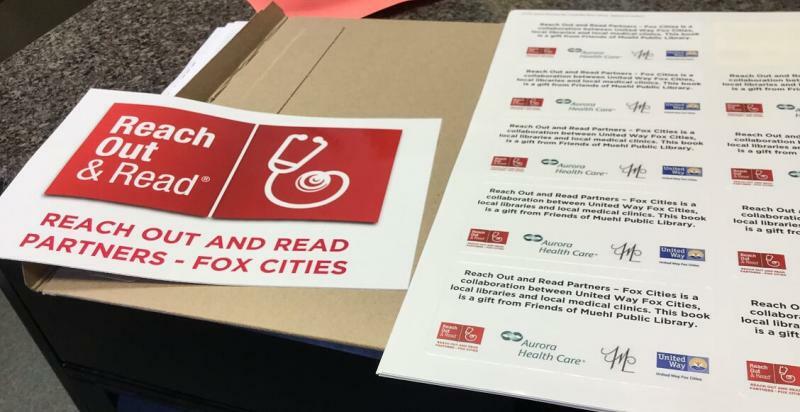 We are thankful to Abbey Unruh who works at the Appleton Public Library and administers the program regionally. To find out more about this wonderfully important and successful program please go to : REACH OUT AND READ. ***Attend the monthly meetings at the library. Every 3rd Thursday of the month at 6:30pm. (IN THE MEETING SPACE @ THE LIBRARY.) We don't meet in July or December. What are the Friends' missions? Broaden community awareness and use of library services and resources. Support the library in developing library services and resources as needed in our community. Raise funds through membership dues and special events to supplement the library budget for materials, equipment and services. From left to right: Elizabeth Moeller, President; Kris Peters, Secretary; Deanna DeBruin, Treasurer and Ann-Marie Karweick, Vice-President. Bulldozer was a prop in the parade for the summer reading theme: BUILD A BETTER WORLD, 2017. And all officers are sporting eclipse glasses which were trending when the picture was taken! Meetings are held in the library meeting space unless otherwise posted. The Friends support all activities and services at the library. Everyone is welcome to attend a meeting and see how YOU can help! 16th Annual Wine Tasting Raffle Winner! Elaine won the Dinner and A Show, dinner @ Black & Tan, GB and a Let Me Be Frank show at the Meyer in GB. Congratulations, Elaine! 16th Annual Wine Tasting Meat Raffle Winner! Rhonda won the meat raffle (part A) the 10 pounds of beef from Home of the Hamburger c/o Steve Kemp. Congratulations, Rhonda!